Suleikha Snyder : A Ravenous Night! Last night, March 2, I had the pleasure of participating in the monthly Ravenous Nights reading series held at the Happy Ending Lounge on New York's Lower East Side. As the name of the establishment implies, it was a "massage parlor" in its previous incarnation — and, while the outside is unassuming, the entryway and upstairs lounge where the reading takes place are quite lovely! It's an intimate, cozy space with a beautiful bar and a semi-circle of comfy booths. Ravenous Romance's Debra Hyde and Lori Perkins are gracious, welcoming, supportive hosts, and my fellow readers, Mo Beasley, Nick Kaufmann and Jefferson, shared very entertaining pieces. As for me...I was second up to bat, reading from Spice and Smoke and marking the novella's official public debut! Though I do have a little experience performing, it's been a very, very long time since I was in front of an audience. Fortunately, I'd practiced my excerpt a few times so I wouldn't stumble over problem areas. An extra bonus? The slender black podium set up for readers was taller than I was, and the lighting was low. So, basically, any nerves I may have had about reading in front of people disappeared, because I couldn't see anything except my pages! Being a hobbit definitely has its advantages. All kidding about my height aside, it's invigorating to share your work with people, to introduce characters you love in the hopes that others will love them just as much. Those gathered at Happy Ending met co-stars Avi Kumar and Michael Gill as they discovered a simmering, albeit ill-advised, attraction. I tried to take myself out of the equation and focus on giving them the spotlight. To that end, I read in an Indian accent and even attempted Michael's somewhat more British cadence. 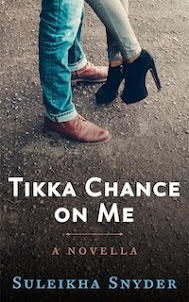 "Getting into character" really helped; I felt like I was in the story...and I hope those who ultimately read Spice and Smoke feel just as absorbed! I wish I could have been there! I'm looking forward to seeing more of your stories, Suleikha. Thanks, Eilidh! Who knows what else 2012 will bring? Truly speaking I did not know about you.I just read out one article from yahoo. Then I was searching about your writing and I found your blog. So I am starting to follow you. I am excited about "spice and smoke". surely will read this. I want to know more about your writings, How can I go about it?Please tell,wish you all success. You were a wonderful reader, Suleikha, and we'd love to have you join us again sometime. I was personally enamored with your ability to convey accents -- you really brought your story to life with them! Thanks, Debra! I would love to come back and read again. I didn't even know I could really pull off an accent until I was doing it!